Two-sentence summary: After Rukhsana’s conservative Muslim parents catch her kissing her girlfriend, they send her to Bangladesh to immerse her in tradition. By reading her grandmother’s old diary, Rukhsana is able to discover important truths about herself and her culture. 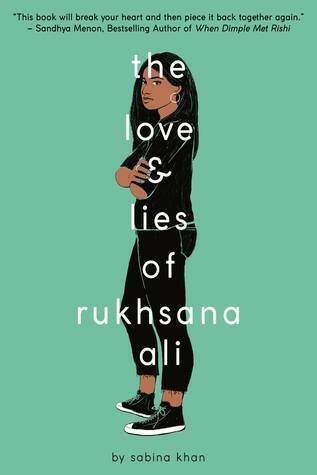 Portrayal of LGBTQ issues: The Love and Lies of Rukhsana Ali follows a cis lesbian protagonist who is forced into an arranged marriage after her parents discover that she’s fallen in love with a woman. Although it explores the pain and discrimination Rukhsana faces from her culture, it does not portray her family or Bangladeshi people as evil or outdated. Instead, most characters are portrayed as good, kind people who are genuinely trying to do the right thing but have different ideas about what that is. This #OwnVoices novel was written by an author from Bangladeshi descent who writes about Muslim teens caught between two cultures. Although Sabina Khan herself doesn’t identify as LGBTQ, she mentioned on Twitter that she was inspired to write this novel after her daughter came out. What I loved: Despite how heavy this book’s themes are, it’s also surprisingly hopeful. Even though Rukhasana’s flown far away from home into an arranged marriage with someone she could never feel attracted to, she finds people who love her for who she is and keep her going. Her uncle and grandma try to convince her unaccepting parents that Rukhsana’s queer identity isn’t as condemning as they think. Irfan, her arranged husband-to-be, validates her anguish and empathizes with her as a gay man. And while her parents put her through a lot of trauma, their love and concern for their daughter make their characters more nuanced than they seem. I especially loved the emotion in this book and how easy it was to empathize with many of the characters. Muslim or Bangladeshi culture isn’t portrayed as evil (though it does explore the cruelty queer Bangladeshi people face) but a very different viewpoint from what Rukhsana’s liberal friends or partner understand. The novel vividly portrays her frustration with not only having to push against her culture’s restrictive view on homosexuality but also how boxed in she feels by both her LGBT and Bangladeshi identity. There aren’t a ton of LGBT YA books out there that portray characters straddling between religious and queer identities in a positive light, but I felt like this book did so in a fair and humanizing way. The main reason I didn’t rate this book any higher is because I felt that the writing was a little confusing at times, but that’s more of a technical issue than anything. It doesn’t take away from the story but is noticeable enough that I didn’t feel comfortable giving a 4.5 or 5. Recommended: Novels about queer teens who have unaccepting parents are fairly common, but this is one of the more important YA books to read with that theme. I felt like this was an especially complex and empathetic take. There are so many diverse books with LGBTQ protagonists coming out (no pun intended) this year and each one has such a meaningful story to share.